Slatgrid Mall Kiosks are ideal for creating professional looking portable kiosks very quickly! Slatgrid Mall Kiosk Displays provide great versatility, and with the addition of slatwall or gridwall accessories such as shelves, hooks, faceouts, hangrails, waterfalls and additional slatgrid panels from our large selection, the merchandising possibilities with Slatgrid Mall Kiosks are endless! Slatgrid Mall Kiosks are simple to assemble, disassemble and reconfigure, making them ideal portable kiosk displays for trade shows and shopping malls. Please contact a knowledgeable Palay Display Representative if you have questions about our Slatgrid Mall Kiosks. 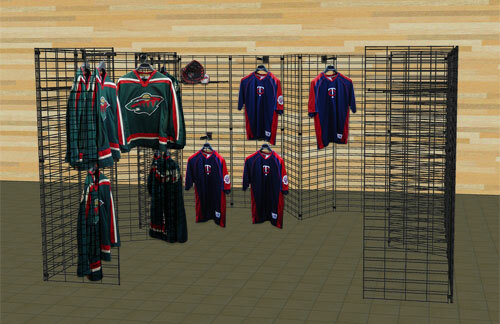 Please note: These slatgrid kiosks are intended for display and merchandising items such as clothing and giftware. If using with heavyweight items or outdoor displaying where weather can be a factor, additional bracing or anchoring may be needed. Please consult your Palay Display representative for more information.